You'll want to use a program that allows you to create columns. You can do this in Microsoft Word or Excel or Google Sheets, for instance. I used Photoshop Elements, because I have that and it was slightly easier to adjust sizing that way. You can view it through this link. To download it and make your own changes, click here to download the spreadsheet file. You can then edit in Excel or Open Office or reupload to Google Sheets (New >> File Upload, then "Open with Google Sheets") to make your own editable copy. We mostly shop at Safeway — no affiliation, just a fact — and I'd downloaded the Safeway app to my phone. 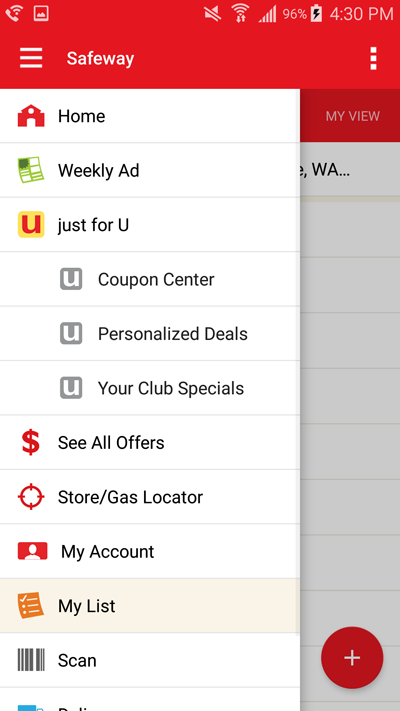 I'm imagining many stores have such apps, and for Safeway at least, there's a regular website, too. 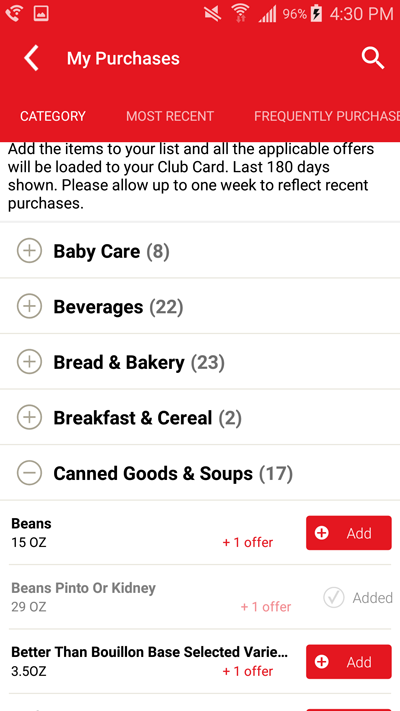 I'm hoping purchase tracking through such an app is a feature for any of you who use a club card. I know some people eschew using a club card because of this very tracking, but let me tell you that it came in handy like gangbusters for this project. 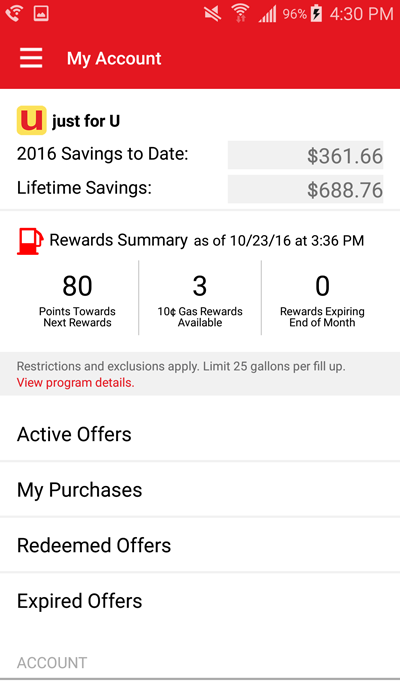 I was able to go into my Safeway app and select my purchase history for the past six months. If I haven't bought it in six months, I probably don't need it on my everyday list! 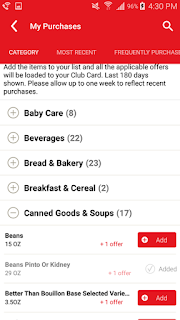 If you don't have any purchase tracking available to you, you'll have to do your best to assemble a list of your regular purchases by checking your pantry and your memory bank, and adding to the list as new items come to light. Sometimes I embrace the inefficiency of darting from aisle 2 to aisle 13 and then back to aisle 5. I chalk it up as good movement for my body. But sometimes, with three kids and limited time, I just want to get my groceries fast and get out. Ok, most of the time. So I thought it would be really nice to have a list in aisle order. 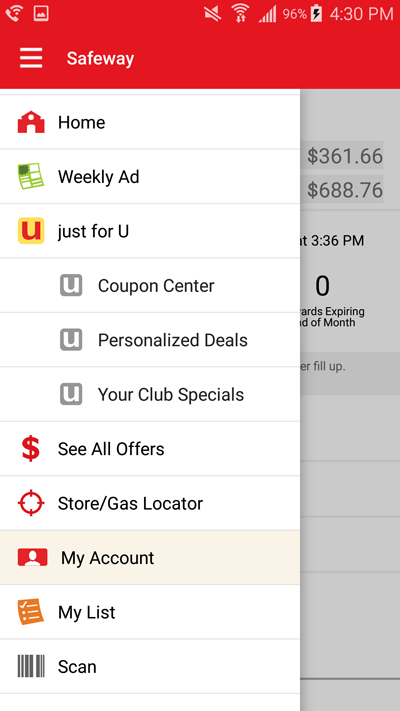 Enter: The store's app again. 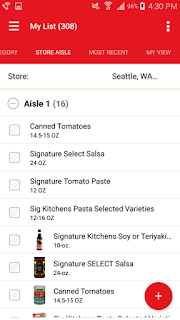 The Safeway app allows you to add your recent purchases to your shopping list, then sort your shopping list by aisle. This is the order that your particular store's aisles are in. Bingo! I've redacted the store address, but it's targeted to my particular store. 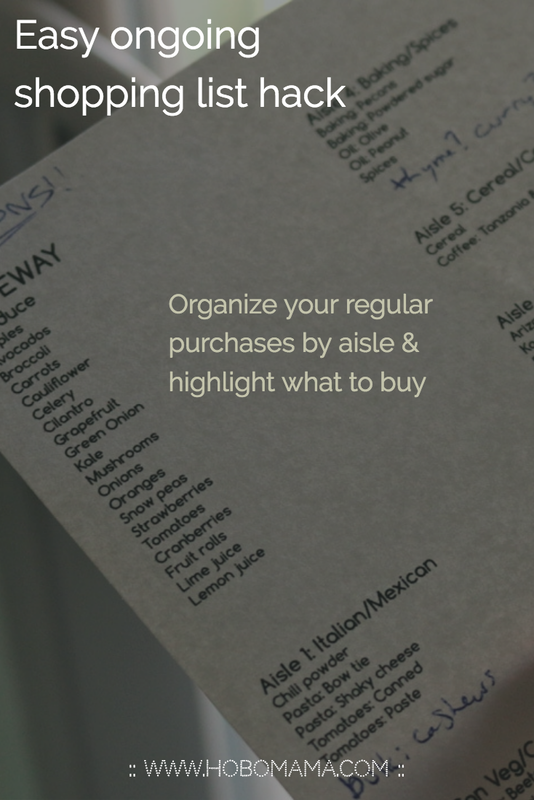 Go through & write down your purchases by aisle & section. 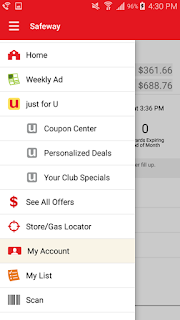 If you're out of luck on the app front, don't despair! Just take a dedicated trip to your favorite grocery store(s) to make your own aisle map. 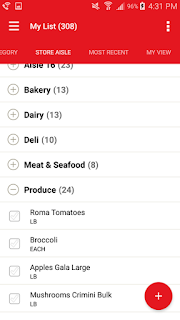 Go aisle by aisle (including the sections outside the aisles) and note what items are where, and which items you buy if you don't have a purchase-history list to draw from. We did this with Costco, and it wasn't too much of a pain. Plus, you do it just once, and then you're golden! So now we had to figure out how to use the list. For a long time, I assumed I wanted to go laminated, and therefore I kept putting it off. Because, while I know there are easy at-home laminating pouches (and I've used them before), as well as the possibility of ponying up for professional laminating at an office-supply store, the thought of Carving This List in Stone (er, lamination) freaked me the freak out. I wasn't sure if this was The Final List! 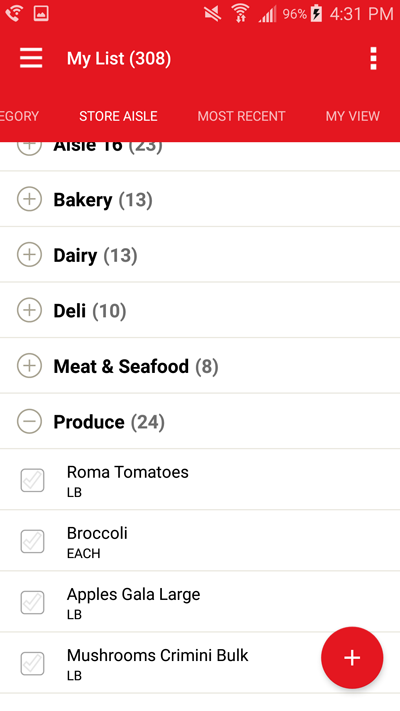 I wasn't sure if I'd want to add or subtract items the next day! And the day after that! I decided it could be just paper. Yup, just printed out on our home printer. You can use recycled paper to make the waste more palatable. Kids' artwork on the back adds a festive touch to your shopping! But to fit everything on one page, the font was small, so it would be a challenge to circle or underline items without crossing them out inadvertently. If you tried to star items, you might confuse which item was starred. My brainstorm: Highlight! Now, above the list on the top of the fridge, we keep a yellow marker (you could use a legitimate highlighter; I just grabbed a yellow marker from the kids' stash) and a ballpoint pen. When we know we want to buy something, we highlight it in yellow. 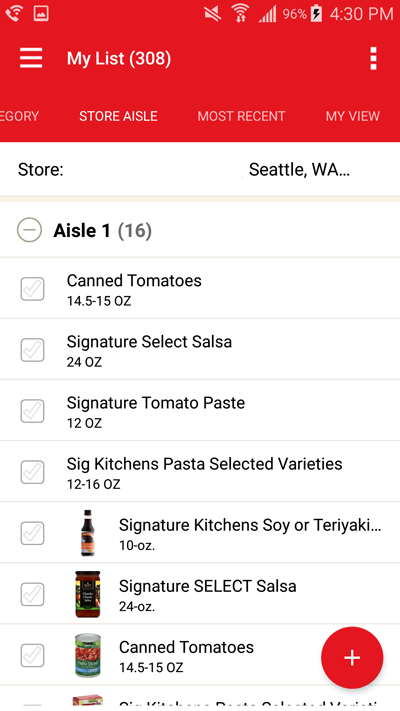 We use the pen to add items that aren't on the permanent list, make notes about the item (such as "x2" or "spicy flavor"), and to cross off any highlighted items we've bought in the meantime. When we're in the store, I first would mark off the items as we went along. But it turns out that, since they're in aisle order, we can put the pen away and just march along, making sure to buy all the items in one aisle before leaving to the next. I fold the list along the column lines so that I have one column in view at a time, then flip to the next when I move on. This was the tricky bit, I admit! You'll have to work with your particular sheet to make it all fit. Again, you can use my Google Sheets template to get you started (view here or download here). Your aisle arrangement and amount of items will be different from mine, of course, so I can't figure it all out for you in advance. You'll have to fiddle around with it to get it all to work. Teensy fonts are your friend. Try out different fonts to see if there's one that's squishier but still reads well. Leave off items you buy only very occasionally, or group them under an umbrella item that can be expanded when the need arises. For instance, do you buy cake mix and candles for four birthdays a year? Maybe put the item "Baking goods" under the appropriate aisle and just add a note about what in particular you want when the time comes. Remember to leave breathing space between columns and aisles for notes and additions. We had enough room on the side of ours to add an extra column for Costco and space underneath to fill in other shopping needs, such as the drugstore. 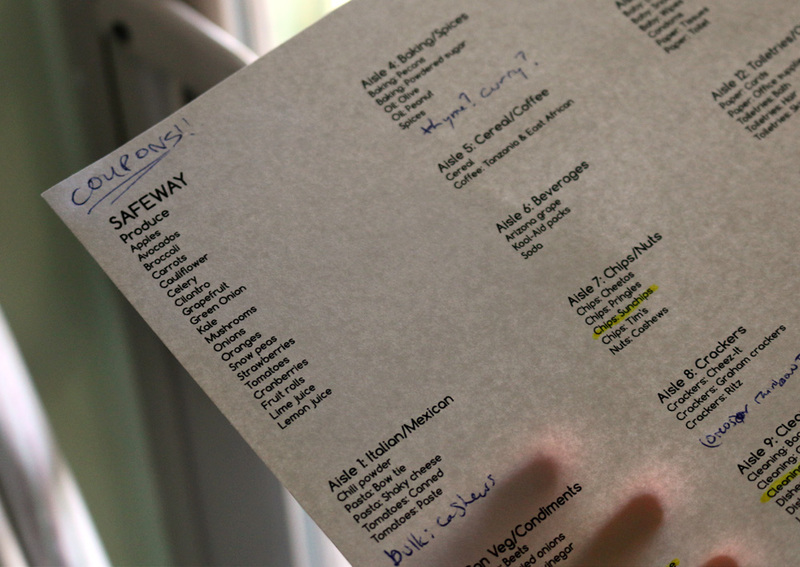 For Costco, we went aisle by aisle on one memorable trip and wrote down everything we usually buy and where they all could be found. We didn't have to write down each aisle in the store, just the ones we needed, so it all fit in a single column. I arranged the items within my aisles alphabetically. You could alternatively arrange them by the order the items are found within that aisle. Kudos to you if you take the time to do this! Maybe I will someday. For now, alphabetical works all right. To make the alphabetical system sort like items together, I prefaced similar types of items with the same category. For instance, if you wanted a bunch of canned veggies, you could put Canned: Green Beans, Canned: Okra, Canned: Peas and Carrots. That way, you'd be looking for all the canned items at once when in that aisle. While often we're not particular about what precisely we get of an item (apples = whatever decent apples are cheapest), we got specific with items that needed to be. If there's a particular barbecue sauce you use, you might as well make the item on your list be Brand Name BBQ Sauce in Honey Smoke Flavor. That way, there's no confusion no matter who's doing the shopping. We added in pricing guidelines (e.g., "<$3/lb") for things like meat, to be sure we didn't bother to buy when it wasn't a good deal, and to stock up when it was. Am I embarrassed showing you my grocery list? Yes. Yes, I am. Don't be judging my multiple categories of chips. Hope this helps someone else! 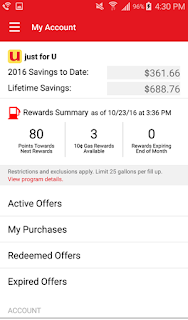 It's been a big benefit for us to have such an easy shopping solution to use. 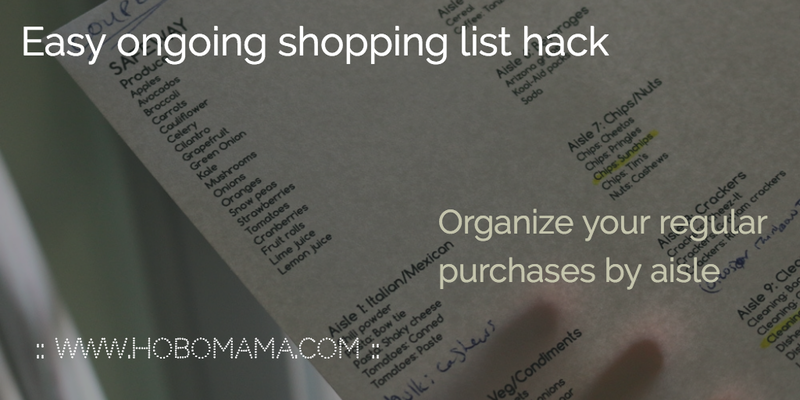 Let me know your shopping-list hacks and what works for you in the comments, and I'd love to hear from you if you decide to use this method! #ad Got cats? Or just like money? 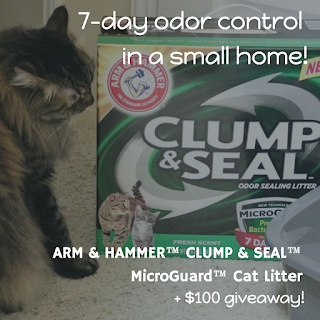 Be sure to enter my sponsored giveaway for $100 from ARM & HAMMER™ CLUMP & SEAL™ MicroGuard™ Cat Litter!